This winter while skiing I came across a Green Curry Stew that was so hearty, delicious and warming, that I couldn’t stop thinking about it! I was obsessed with coming up with a similar recipe with my favorite veggies, a savory, spicy green curry broth with shredded chicken meat stewed to perfection. I came home and worked on it until I came up with something pretty darn close. Unlike most green curries that have a lot of coconut milk, this one has essentially a clear broth with just enough coconut milk to add some richness. 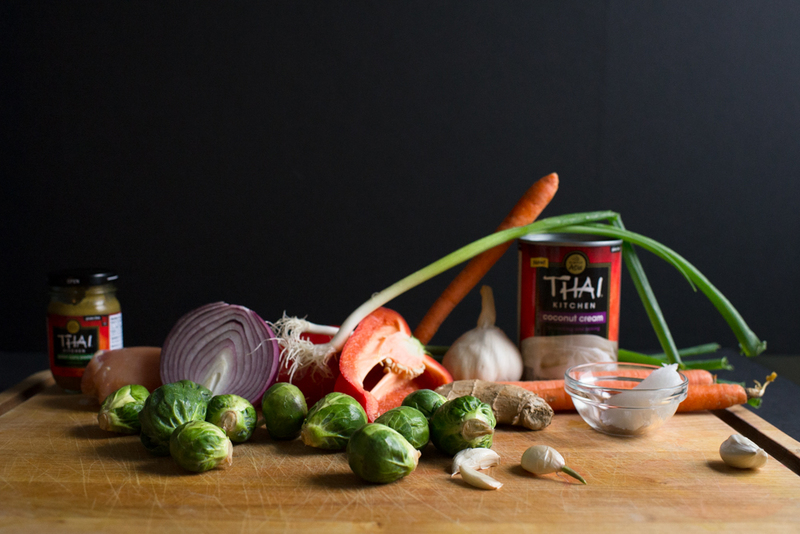 Green curry paste, which can be found in a very small jar in most groceries Asian sections, makes cooking with Thai flavors easy (I buy the “Taste of Thai” brand). I add 2 tablespoons of green curry paste which feels like just the right amount of heat. Start with 1 tablespoon and add more to suit your taste. If you have a little lemongrass cut a piece, bruise it a little, and let it stew in your curry to give it a lemony aroma. This recipe can also be adapted to include other favorite veggies like mushrooms, bok choy, sweet potatoes or squash. Make it vegetarian by using using lentils and vegetable broth instead of chicken and water. Heat oil in a large heavy pot at medium heat, add carrots, two types of onions, and peppers and sautée for about 2-3 minutes until slightly soft. Add ginger, garlic, and green curry paste (start with 1 tablespoon) and cook 1-2 more minutes. Place Brussel sprouts and chicken thighs in the pan, and add about 4 cups of water to cover the veggies and chicken. Add coconut milk and lemongrass and bring the water up to a boil. Once boiling, reduce to a simmer, cover, and cook for at least 45 minutes to an hour, checking and stirring every 10 minutes. Stew is done when chicken is well cooked and can easily fall off the bones. Add additional green curry to achieve desired spiciness. Add salt to taste. Just before serving, use a fork to remove chicken from the bones. Return shredded chicken to the stew and discard the bones. 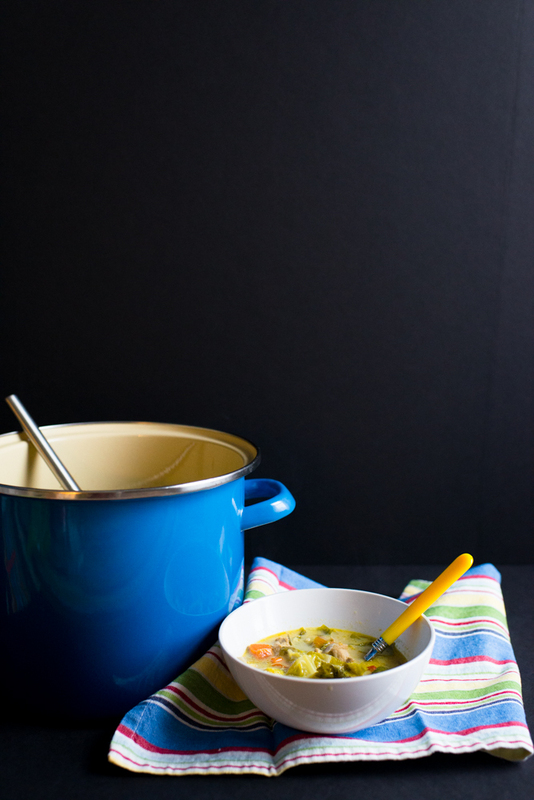 Chicken stews with veggies are a great babyfood and can easily be blended to the consistency that your baby is ready to eat. Add just teaspoon of green curry paste to the pot to add flavor but not too much spice. Once ready to serve, take out a portion for baby and then add additional green curry paste to give the stew a stronger flavor for the rest of the family. Baby’s portion can be blended as much or as little as she is ready to eat. Think kids can’t get used to green curry? In curry-eating countries like Thailand and Sri Lanka, babies are introduced to mild curry flavors as infants, so that by the time they are in preschool, curry is as normal to them as mac n’cheese! When it comes to getting kids to eat in an adventurous way, early exposure is key!  “This stew is really amazing. 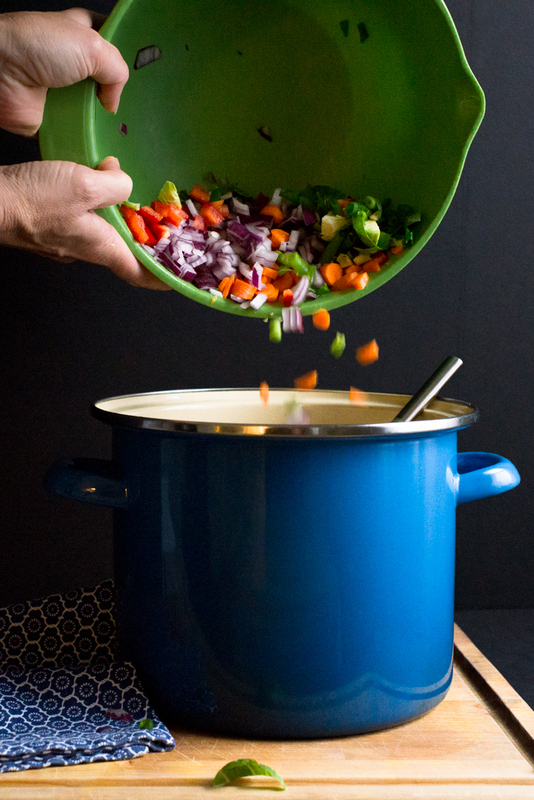 The broth is very flavorful!” —Rebecca, a grown up.